2019-02-01: Computationally efficient large-scale prediction of RNA interactions: methods and applications. The defence will take place on February 1st, 2019 from 14:00-17:00 at Aud - A1-05.01 (2-02), Dyrlægevej 100, 1870 Frederiksberg. 2018-04-25: Wolfgang Hess, University of Freiburg, DE. The seminar will take place April 25, 15.15 - 16.00 at University of Copenhagen, SUND/SCIENCE, Building 1-04, Grønnegårdsvej 7, 1st floor library, Frederiksberg C.
2017-11-08: by Yann Ponty. LIX - Batiment Turing, Ecole Polytechnique, France. The seminar will take place Nov 08, 15.30-16.30 at University of Copenhagen, SUND/SCIENCE, Building 1-04, Grønnegårdsvej 7, 1st floor library, Frederiksberg C.
2017-06-22: by Hanah Margalit, The Hebrew University of Jerusalem. The seminar will take place June 22, 14.00-15.00 at University of Copenhagen, SUND/SCIENCE, Building 1-04, Grønnegårdsvej 7, 1st floor library, Frederiksberg C.
2017-06-23: Towards a systems-level understanding of RNA secondary structure and interactions. The defence will take place on June 23rd, 2017, 14.15-17.15 in Auditorium A2-70.03, Thorvaldsensvej 40, 1870 Frederiksberg C.
2017-05-24: by Martin A Smith, Garvan Inst. of Medical Research. The seminar will take place May 24th, 15.00-16.00 at University of Copenhagen, SUND/SCIENCE, Grønnegårdsvej 7, 1st floor library, Frederiksberg C.
2016-09-27: by Maria Duca, UMR7272 CNRS – Université Nice Sophia Antipolis. The seminar will take place Sep 27th, 10.00-10.45 at University of Copenhagen, SUND/SCIENCE, Grønnegårdsvej 7, 1st floor library, Frederiksberg C.
2016-09-19: University of Copenhagen, 10.00-11.45, at Festauditoriet, A1-01.01, Frederiksberg Campus, Bülowsvej 17, 1870 Frederiksberg C, Denmark. Speakers: Kay Niesselt, University of Tübingen and Daniel Gautheret, Université Paris Sud. 2016-07-07: by Fritz Henglein (DIKU). The seminar will take place July 7th, 13.15-14.00 at University of Copenhagen, SUND/SCIENCE, Grønnegårdsvej 7, 1st floor library, Frederiksberg C.
2016-06-27: by Mogens Sandø Lund, Aarhus University. The seminar will take place June 27th, 13.30-14.15 at University of Copenhagen, Grønnegårdsvej 3 ( building 1-61), 2nd floor library, Frederiksberg C.
2016-06-28: Porcine Models of Human Obesity - microRNA and Gene Expression. The defence will take place on June 28th, 13:00-16.00 in Fest auditoriet (Aud. A1-01.01), Bülowsvej 17, 1870 Frederiksberg C.
Everybody is welcome. Registration is not necessary. 2016-04-29: RNA interactions of coding and non-coding RNAs. The defence will take place on April 29th at 13:30 in Auditorium A2-70.03, Thorvaldsensvej 40, 1870 Frederiksberg C.
2015-12-07: The potential of RNA 3D Modules in the prediction of structured RNAs. The defence will take place on Decemebr 7th at 13:00 in Orangeriet, Dyrlægevej 36, 1870 Frederiksberg C.
2015-10-07: Danish national workshop on non-coding RNA. Keynote Speakers: Ronald Breaker, Yale University. Speakers also include: Morten Sommer, Torben Heick Jensen and Anders Lund. Location: University of Copenhagen, The Ceremonial Hall, Frue Plads 4, 1168 Copenhagen. 2015-09-10: by Jennifer Harrow, Wellcome Trust Sanger Institute, UK. The seminar will take place September 10th, 14.15-15.00 at University of Copenhagen, SUND/SCIENCE, Orangeriet, Dyrlægevej 36, Frederiksberg C.
2015-09-01: by Manja Marz, University of Jena. The seminar will take place September 1st, 13.15-14.00 at University of Copenhagen, SUND/SCIENCE, Grønnegårdsvej 7, 1st floor library, Frederiksberg C.
23-06-2015: University of Copenhagen, 13:25-16:30, Orangeriet, Dyrlægevej 36 at Frederiksberg Campus. Speakers: Martien Groenen, Uwe Ohler, Thomas Litman and Lars Juhl Jensen. 2014-10-03: by Niels Frandsen, Exiqon. The seminar will take place October 3rd, 12.30-1.15 at University of Copenhagen, SUND/SCIENCE, Dyrlægevej 16, Orangeriet, Frederiksberg C.
cphRNA 2014 - Symposium "non-coding RNAs: from Discovery to Function"
2014-06-27: cphRNA 2014 - Symposium "non-coding RNAs: from Discovery to Function" (free), 09.15-17.05, at festauditoriet, A1-01.01, Frederiksberg Campus, Bulowsvej 17, 1870 Frederiksberg C, Denmark. Organised by RTH and COAT. 2014-02-25: by Mario Moerl, Institute of Biochemistry, University of Leipzig. The Seminar will take place on February 25th, 14.15-15.00pm at University of Copen­hagen, SUND/LIFE, Dyrelægevej 36, Orangeriet, Frederiks­berg C.
RTH and COAT are co-organizing a Summer School in RNA Bioinformatics. The event will take place on June 23rd to June 28th in the Copenhagen area. Details to follow. Program and application procedure will be made available here. 2014-01-30: by Danny Barash, Department of Computer Science, Ben-Gurion University. The Seminar will take place on January 30th, 11.15am-12.00pm at University of Copen­hagen, SUND/LIFE, Grønnegårds­vej 7 (bldg. 1-04), 1st floor, Library/M106, 1870 Frederiks­berg C.
2014-01-31: Impact of mutations in structured RNAs. The defence will take place on January 31st at 13:15 in auditorium A2-70.03, Thor­vald­sens­vej 40, ground floor, University of Co­pen­hagen, LIFE, Frederiksberg. 2013-10-08: In Silico detection of RNA-seq profiles in high-throughput sequencing data and their relation to non-coding RNAs. Venue: Orangeriet, Dyrlægevej 36, Frederiksberg C. Time: 13.00h. 2013-09-16: Torben Heick, Centre for mRNP Biogenesis and Metabolism; Department of Molecular Biology and Genetics, Aarhus University. 2013-07-04: by Lynne Maquat Lynne E. Maquat, Center for RNA Biology, University of Rochester, USA. The Seminar will take place on July 4th, 11.15am -12.00pm at University of Copenhagen, SUND/LIFE, A1-01.15 / Building 1-01, Bülowsvej 17, 1. sal, 1870 Frederiksberg C.
2013-04-25: by Alessandro Quattrone, CIBIO - University of Trento, Italy. The seminar will take place 14:15-15:00, at University of Copenhagen, SUND/LIFE, A1-01.13 / Building 1-01, Bülowsvej 17, 1. sal, 1870 Frederiksberg C.
2013-04-03: by Marc Friedlander, Centre for Genomic Regulation, Spain. The seminar will take place at April 3rd, 11:15-12:00, at University of Copenhagen, SUND/LIFE, A1-01.13 / Building 1-01, Bülowsvej 17, 1. sal, 1870 Frederiksberg C.
Seminar: RNA interactions with other RNAs and Proteins. 2012-08-24: Symposium on August 24th at 9:30-15:45. Location: Lundbeck Auditorium, Copenhagen Biocentre, Ole Maaløes Vej 5, Copenhagen. Read the program here. RTH is co-organizing a PhD course on RNA sequencing and computational analysis together with Centre for Computational and Applied Transcriptomics (COAT). The course is held at Dept. of Biology, University of Copenhagen on August 20-24, 2012. The program is available here. 2012-06-06: by Janusz Bujnicki, Laboratory of Bioinformatics and Protein Engineering, International Institute of Molecular and Cell Biology, Warsaw, Poland on June 6th at 14.00-15.00 in auditorium A1-01.14, Nordre sti 2, 1st floor, University of Copenhagen, LIFE, Frederiksberg. Seminar: Circular non-coding RNAs â€“ new type of players in gene regulation. 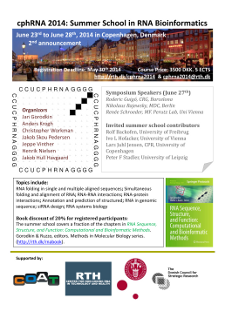 2012-05-23: by Jørgen Kjems, Department of Molecular Biology, Aarhus University on May 23rd at 11.15-12.15 in auditorium A1-01.14, Nordre sti 2, 1st floor, University of Copenhagen, LIFE, Frederiksberg. 2012-05-09: by Anders H. Lund, Biotech Research and Innovation Centre (BRIC), University of Copenhagen on May 9th at 14.00-15.00 in auditorium A2-70.02, Thorvaldsensvej 40, ground floor, University of Copenhagen, LIFE, Frederiksberg. 2012-03-28: by Eric Westhof, Architec­ture et Réactivité de l’ARN, Université de Strasbourg, Institut de Biologie Moléculaire et Cellulaire, CNRS. At 14:00 in auditorium A2-70.04, Thorvaldsensvej 40, University of Copenhagen, LIFE, Frederiksberg. 2012-03-14: by Robert Giegerich, Center of Biotechnology and Faculty of Technology, Bielefeld University. At 14:00 in auditorium A2-84.-11, building 2-84, Thorvaldsensvej 40, University of Copenhagen, LIFE, Frederiksberg. 2012-01-19: University of Copenha­gen, at 12:30, lecture room A2-83.01, Thorvaldsensvej 40 at Frederiksberg campus. Speakers: Bernhard Boehm, Gary Stormo, Peter Stadler, John Mattick and Niels Tommerup. 2011-12-20: by Hakim Tafer, University of Leipzig, Institute for Bioinformatics. At 14:00, University of Copenhagen, LIFE, Grønnegårdsvej 7 (bldg. 1-04), 1st floor, Library/M106, 1870 Frederiksberg C.
2011-11-17: by Christian Reidys, University of Southern Denmark. At 14:00, University of Copenhagen, LIFE, Grønnegårdsvej 7 (bldg. 1-04), 1st floor, Library/M106, 1870 Frederiksberg C.
2011-05-26: Max Planck Institute for Mathematics in the Sciences. Inselstraße 22. 04103 Leipzig. Germany. 2011-05-23: By Christian Höner zu Siederdissen, University of Vienna, Austria. At 14:00, University of Copenhagen, LIFE, Grønnegårdsvej 3, Building 1-61, Library 2nd Floor, 1870 Frederiksberg C.